In New Jersey, security deposit rules can be found in The Rent Security Deposit Act. 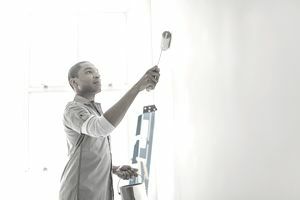 This Act contains basic laws landlords and tenants must follow for collecting deposits, making deductions from a deposit and the procedures for returning a tenant’s security deposit. Learn six essentials of the statewide law. Also, you should always check with the town or county where your investment property is located to determine if there are additional rules that apply. In New Jersey, the most a landlord can charge as a security deposit is one and a half month's rent. If a landlord increases a tenant's rent, the landlord can also raise the security deposit to coincide with this rent increase, but cannot ask for more than a 10 percent increase in the security deposit in any given year. Money Market Fund- A landlord is allowed to invest the security deposit in a money market fund as long as the investment company is based in New Jersey, is registered under the Investment Company Act of 1940, has shares that are registered under the "Securities Act of 1933, and the fund has a maturity date of a year or less. Interest-Bearing Bank Account- Landlords who own 10 or more units must place the security deposit in a bank account that pays interest at a rate equal to or greater than the interest paid on the bank’s money market accounts. Landlords who own fewer than 10 units also have to place the money in an interest-bearing bank account, but there is no specific requirement as to the interest rate. The landlord is required to pay the tenant the interest or the earnings generated on their security deposit annually. If the tenant wishes, they can have this amount credited toward their next month’s rent instead. In New Jersey, if a landlord does not store a tenant’s deposit in the proper account, the tenant may provide written notice that they want the landlord to use their security deposit, plus seven percent interest, to pay their rent. The landlord is not able to ask for any additional security deposit. 3. Is Written Notice Required in New Jersey? Within 30 days of receiving the security deposit- Landlords are allowed to include this notice as part of the lease agreement. If the security deposit terms are included in a security deposit lease clause, no additional written notice is necessary. Within 30 days of moving the security deposit to a different bank or money market fund. Once a year that coincides with the annual interest payment. Within 30 days of transferring ownership of the property. Name of the bank or investment company. Address of the bank or investment company. The type of account where the security deposit is invested or deposited. The amount of security deposit. The signature of the landlord or landlord’s agent. If the landlord does not pay the tenant the interest the tenant is entitled to or fails to provide written notice when they are required to by law; the tenant can provide written notice that the landlord must do so. After receiving this written notice, if the landlord does not follow through within 30 days, the tenant’s security deposit may be used as rent, and the landlord is not allowed to request an additional deposit. Damage to the property more than normal wear and tear. The landlord is not allowed to make any deductions from the security deposit until the tenant has moved out of the unit. 30 Days: In New Jersey, a landlord must return the security deposit within 30 days after tenants move out or their lease termination. Any accumulated interest or earnings must also be returned. If the landlord has deducted anything from the security deposit, the landlord must include an itemized list of the deductions. 15 Days: If a tenant has ended their lease because they are a victim of domestic violence, the landlord only has 15 days to return the security deposit. 5 Days: If a tenant has been displaced due to a flood, fire, evacuation or condemnation of property, the landlord is required to return the security deposit within 5 days. 6. What Happens to the Security Deposit If You Sell Your Property? If you sell your property, it is your responsibility to transfer the security deposits, along with any interest accrued, to the new owner within five days. You must also notify the tenants, by registered or certified mail, of the transfer of their security deposit to the new owner within 30 days of the transfer. The new owner’s name and address must be included in this written notification. The new owner will be still responsible for returning the deposit to the tenant, plus any accrued interest, even if you never transfer the security deposits to him or her. What Is New Jersey’s Security Deposit Law? The complete text of New Jersey’s security deposit law can be found at New Jersey Statutes Annotated 46:8-19 to 26.